DARCO BROACH & GEAR INC.
Fellows No. HOR-Z Horizontal “Z” Model Gear Shaper s/n 17719 w/ 20” 3-Jaw Chuck, 8 3/8” Thru Spindle Bore. Fellows Type 7125A SPECIAL Vertical Gear Shaper s/n 29825-3501. Fellows Type 7125 SPECIAL Vertical Gear Shaper s/n 29433-355. Fellows Type 712 SPECIAL Vertical Gear Shaper s/n 29214-351. Fellows Type 75A Vertical Gear Shaper s/n 28272-1501. Barber Coleman mdl. 6-10 6” x 10” Gear Hobber s/n 4663. Barber Coleman mdl. 6-10 6” x 10” Gear Hobber s/n 4432. Barber Coleman mdl. 6-10 6” x 10” Gear Hobber s/n 4122. Barber Coleman mdl. 6-10 6” x 10” Gear Hobber s/n 3880. Barber Coleman No. 4-4 8” x 10” Gear Grinder s/n 987. Fellows Type 3 SPECIAL Fine Pitch Gear Shaper s/n 30788-657. Fellows No. 3 Fine Pitch Gear Shaper. Felloes 3 ½” x 8” Fine Pitch Gear Shaving Machine s/n 30309. Mikron No. 79 Gear Hobber s/n 0910. Mirkon No. 79 Gear Hobber. Hamai mdl. H-79 Gear Hobber s/n 564. Barber Coleman No. 3 Hob Shaping Machine (FOR PARTS). Fellows No. 71 Gear Hobber (FOR PARTS). Thompson Broach and Spline Grinder s/n E51427 w/ 7” x 60” Trunion Style Electromagnetic Chuck, Compound Grinding Head, 9” x 84” Table. Thompson Broach and Spline Grinder s/n E52481 w/ 7” x 48” Trunion Style Electromagnetic chuck, Compound Grinding Head, 7” x 48” Electromagnetic Chuck. Thompson Automatic Spline Grinder s/n B0672 w/ 9” x 94” Table.Automatic Spline Grinder w/ 7 ¼” x 86 ¼” Table. Oilgear Type XL-100 50 Ton x 72” Hydraulic Horizontal Broaching Machine s/n 29611. 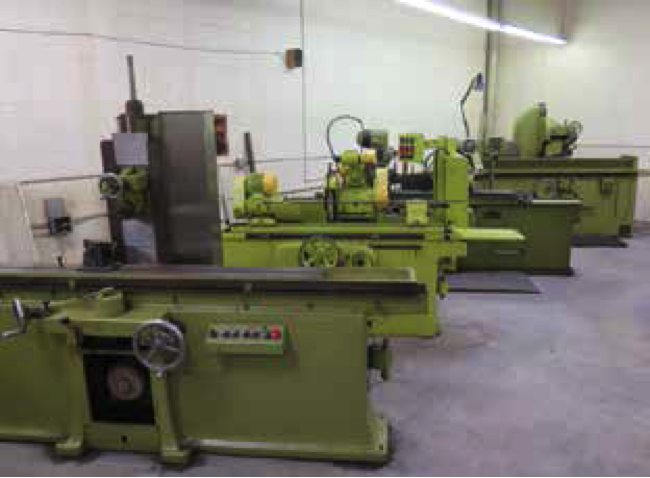 Cincinnati “Hydro-Broach” 2-Head Vertical Broaching Machine s/n 1-30 w/ (2) 5” x 36” Tooling Slide Tables. Acme mdl. 440-2TONS 36” Horizontal Broaching Machine s/n 136. Colonial mdl. PB4-24 24” Vertical Pull-Down Broaching Machine s/n 0-1182- 416 w/ 24” Stroke, 18” x 21” Table. (2) Pioneer mdl. VT0315A Vertical Pull-Down Broaching Machines s/n’s A1591, A1275. Trump mdl. K3VLC 3-Axis CNC Vertical Mill s/n K3VLC- 219 w/ Centroid M-15 Controls, 70-4200 Dial Change RPM, 30-Taper Spindle, 10” x 50” Table. Ponar mdl. TUR-50 20” x 59” Geared Head Lathe s/n 40929 w/ 3 ¾” Thru Spindle Bore, 18-1800 RPM, Taper Attachment, Inch/mm Threading, 12” 3-Jaw and 16” 4-Jaw Chucks. P.Pryibil 34” x 61” (Extended) Cap Spinning Lathe w/ 56” @ Gap. Fexac mmdl. UER Automatic Horizontal Mill s/n 4131 w/ 40-1250 RPM, 40-Taper Spindle, Arbor Support,9 3/8” x 43” Table, Coolant. G.Dufour Universal Mill w/ 21-1600 RPM, 40-Taper Spindles, Power Feeds, 9 ¾” x 43 ¼” Miter Table. Sunnen mdl. AH-222E Automatic Horizontal Honing Machine s/n 1G1-1188 w/ Auto Stroke, Coolant. Landis “LC-UNIVERSAL” 12” x 40” Automatic Cylindrical Grinder s/n 22164 w/ Motorized Work Head, Tailstock, Coolant. Ribon Milano mdl. R.U.R.1000 10” x 40” Cap Cylindrical Grinder s/n 6423 w/ Motorized Work Head, Tailstock, Coolant. Thompson 8” x 36” Automatic Surface Grinder s/n 3B73395 w/ Electromagnetic Chuck, Coolant. Jones &amp; Shipman 6” x 18” Automatic Surface Grinder (NO CHUCK). Landis 8” x 68” Surface Grinder. K.O.Lee mdl. S618B 6” x 18” Surface Grinder w/ Acu-Rite Programmable DRO, Walker Electromagnetic Chuck, Coolant, Enclosure. Reid mdl. 618-H 6” x 18” Surface Grinder w/ 8” Motorized Rotary Table. Reid 6” x 18” Surface Grinder w/ Walker Magnetic Chuck. Reid mdl. 2C 6” x 18” Surface Grinder w/ Magnetic Chuck. Ex-Cell- O Style 74 Cone Grinder s/n 1308 w/ Wheel Dresser. Rockwell 2” Belt / 12” Disc Sander.